This hot weather is perfect for culinary magic – try serving a summer fruit salad in one of these stunners. I came across the idea years ago. 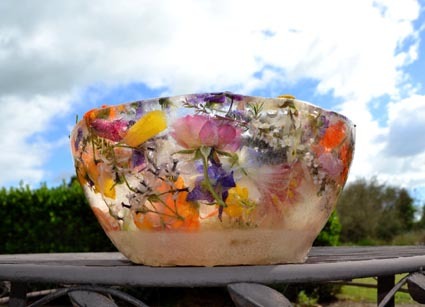 Ice bowls are magical things; the best blooms of summer – roses, marigolds, pansies and violets – frozen within a sparkling bowl of ice. The first step is to collect flowers. The next is to dunk them in a large bowl of cold water and freeze. The most important tip is do not use a big crockery dish, as I did. It cracked clean in half when introduced to warm water. Plastic or metal are just perfect. Timing is important – I had two attempts this year. The first wasn’t quite icy enough after two hours’ in our freezer but I continued any way. I should have waited until the flowers were held down by the ice; they floated to the top and the effect wasn’t as glorious as it should have been. It was still pretty cool. The second attempt, with a tad more patience, produced a beautiful, glistening icy creation. Don’t be limited to using only flowers – in theory any item can be put in the bowl. Sea shells, tinsel, plastic farm animals, whatever takes your fancy. And similar, don’t restrict yourself to bowls. Using a nicely shaped plastic rubbish bin from a $2 shop, we made a very fine ice bucket for a bottle of bubbly. For the internal mould, we used a 2.25 litre plain soft drink bottle, weighted with 1.6kg of pebbles. It worked a treat and the champagne tasted even better. Ice bowls are pretty easy to make but there are a few things to keep in mind. My daughter Iris and I made a short video of how we went about it – click here to watch. First, go on a flower hunt, and collect a range of sizes and colours. Cut them using secateurs; include a little bit of greenery. Keep most flowers whole, but a few petals floating free look good. Clean and remove any insects. Prepare a space for the bowl in freezer – it must be able to sit level. Place in freezer for about two to three hours, or until the edges begin to freeze. This is critical; it has to be partially unfrozen to carry out the next step but icy enough to hold the flowers in place. Remove from the freezer. Place a small bowl in the large bowl and weigh it down with coins or (inside a plastic bag) until it floats, with a little free space between it and the outer bowl. The water will rise up the sides, and the flowers should remain in place, held by the ice. Quickly sprinkle remaining flowers into the water. Return to the freezer, making sure the small bowl is well centred (you can use tape to hold it in place.) Leave 24 hours. Remove from freezer, and remove coins. Pour warm water into the small bowl to slightly melt the ice which is holding it in place and gently remove it. Turn the big bowl upside down, supporting the ice; run warm water over the base and slip ice bowl out. Admire it, then wrap in clingfilm and return to the freezer until you want to use it. Mix fruit in a small bowl, retaining some of the blueberries. To serve, place in the ice bowl, top with borage flowers and blueberries. Have lashings of cream on hand. Pure bliss.